David Stevens has been making music in Central Texas for the past 27 years. David has sung solos with the San Antonio, Lubbock and Austin Symphonies, a well as many other large and small music ensembles. He also had a decade of wonderful experiences singing under the late Maestro Robert Shaw where he was a part of the Grammy-winning Telarc recording of Rachmaninoff’s Vespers. He has been a member of the professional chorus led by Maestro Helmut Rilling in the Oregon Bach Festival since 1993 and he has recorded Dvorak’s Stabat mater and three of Franz Haydn’s last symphonic Masses with the OBF. 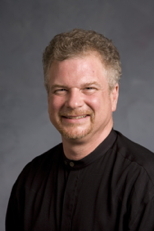 Stevens has been Director of Music at St. David’s Episcopal Church since 1990 and has conducted many Austin ensembles, including Austin Civic Chorus, Austin Vocal Arts Ensemble, and the Austin Symphony. He has entertained Austin audiences as a singer with Texas Early Music Project, La Follia Austin Baroque, and as a jazz singer! His most bizarre and thrilling conducting experience was to conduct the Christmas concert for T.U.B.A. in one of our Capitol’s acoustically wonderful architectural “wells.” David finds it best not to mention his most bizarre and thrilling singing experience!